Paul Meyer in the conservatory at Morris Arboretum, where he will retire after more than 40 years there. Even now, Meyer will not go far. Despite the drizzly day, the rooftops of Chestnut Hill peek from the distant tree line, where he and his wife have bought a home. When not traveling, Meyer aims to continue writing plant profiles and to organize his 105,000 digital images — he’s an avid photographer of gardens and trees — contributing the best to the arboretum’s archives. That type of dedication helps explain his longevity and rise at Morris, a tenure unusual in the botanical world. Meyer is not the only changing of the garden guard. 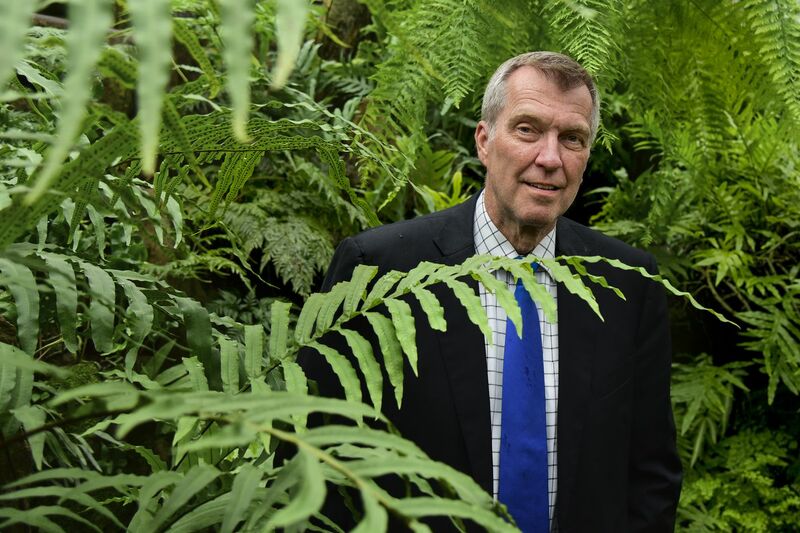 At Jenkins Arboretum & Garden in Devon, Harold Sweetman, who succeeded the original director (his father, Leonard), plans to retire in June after 33 years. That marks the end of 43 years of Sweetmans, who brought significant change to the 48 acres. A pathway system was developed, a pond created, a greenhouse added, staff expanded, and an education center completed. The summer home of siblings John and Lydia Morris, whose family’s wealth came from iron manufacturing, was replete with gardens, fountains, and sculptures. With no heirs, they imagined it transformed into a public institution dedicated to preservation, education, and research. Starting with William M. Klein, the first full-time director from 1977 to 1990, and continuing with Meyer himself, the commonwealth’s official arboretum has grown into a gem. (Otto Haas’ leadership and financial support also played a significant role.) Today, the garden attracts 142,000 visitors annually, offering natural beauty, education to the next generation of horticulturalists, and crucial research on the best plants to sustain Morris, a greener Philadelphia, and gardens near and far. Meyer, tall like a sequoia at 6-foot-4, is gregarious, talking hours about Morris’ progress, its volunteers, its staff, its future, and its trees, his specialty. But he is ever reluctant to claim credit. Ann Reed, an emeritus member of the advisory board, has known Meyer since the mid-'80s, and she praises his adeptness at raising funds — arguably the real fertilizer. Finances. Weeks after he became director, he had to lay off staff (many longtime friends) to fix the finances of the in-the-red Morris. With a balanced budget that has since more than quadrupled to $9 million, Meyer turned to building an endowment, growing it 10-fold since 1991 to its current $60 million. Attractions. Meyer oversaw major face-lifts to fountains, the Victorian fernery, and various buildings. In 1997, the wowee! Garden Railway, a quarter-mile model train track that features buildings made of natural materials, doubled annual attendance to 75,000. Similarly, the 2009 canopy walk boosted visits to 120,000. A youngster watches the popular Holiday Garden Railway made with logs and branches at the Morris Arboretum in 2014. Education. The endowed Internship Program that offers nine paid, yearlong opportunities for hands-on work is his pride. Why? His own in-the-dirt experiences. Meyer was raised in Cincinnati, the older son of a machinist father and stay-at-home mother, the first in his family to get a college degree. “I’ve always been an amateur gardener, even as a kid,” he says of his parents’ small plot and work he did for neighbors. Once at Morris, he became a plant Indiana Jones, traveling Asia and other locales to seek out specimens (he found a rare paperbark maple in China) to augment the arboretum’s living collection. Meyer also is a founding member of the North America-China Plant Exploration Consortium, which has led to “a significant amount of Chinese-origin plants in a number of U.S. public gardens,” says travel companion Kris Bachtell, vice president of collections and facilities at the Morton Arboretum outside Chicago. Initially, Meyer was not interested in helming Morris. But when the finalist withdrew unexpectedly, the board asked him to reconsider. As he reviews his career, Meyer says he has one regret: A state-of-the-art education center hasn’t been built. He has often imagined John and Lydia Morris paying him a visit, he says.